Thoughts on the weekend are short and maybe sweet. Looking forward, I see the need for five wins in the next six to get back on an NCAA track. That would be four straight wins with the loss in the NCHC Frozen Faceoff. But, hey, win the Frozen Faceoff and then there is no need to fret! The Bulldogs should concentrate on this weekend first, then move on to more grand thoughts. Picks by @afiskness. We come into the last weekend of NCHC regular season games and we are still waiting to see who will be the Julie and Spencer Penrose Memorial Cup winner. It should come down to St. Cloud or North Dakota but if both should falter and Nebraska Omaha wins they could still end up in first. Last weekend, it was good to see the Bulldogs go into Oxford, Ohio and beat a team that should beat two nights in a row. Hopefully they have gained some momentum. One thing that cautions my excitement is that fact that Miami's last Saturday night win was a 6-1 win on January 25th against Colorado College. Since then they have scored a total of four goals in four games on Saturday nights and have been shutout twice. 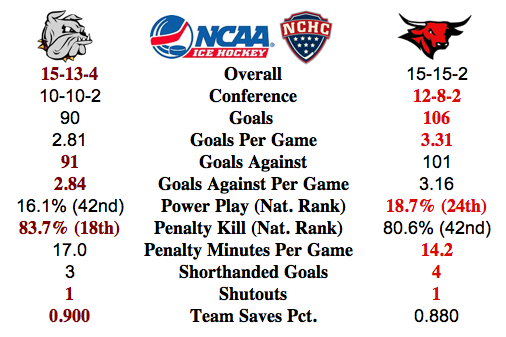 Nebraska Omaha @ Minnesota Duluth: I don't like this match up one bit. The Bulldogs have not played good at home and the Mavericks have had some big road wins this season. No Chipotle in Duluth has me going with a Mavericks win and tie. Western Michigan @ North Dakota: Both teams still have something to play for this weekend which should result in two good games. The home ice should be an advantage for the men's home team from North Dakota, but I think the Broncos will be able to get a split. St. Cloud State @ Colorado College: The Tigers have nothing to play for this weekend as they know they are locked into the seventh place. The Tigers have severe difficulties in scoring goals and playing Huskies isn't going to be easy. In fact this looks like a Husky sweep. Miami @ Denver: The Redhawks travel to Denver to take on the Pioneers. It appears that the Redhawks may have checked out a few weeks ago. The Pioneers are still trying to find some consistency and I think this weekend may be to late in the season for the Pioneers to find it. Pioneers win and tie.